Episode 316 – Do You Self Sabotage Your Progress? Fast forward to two days ago and she comes home after a workout while I’m making dinner and she comes into the kitchen to tell me how it went and I hear rustling in the living room, like whiskey our dog is getting into something he shouldn’t be getting into. 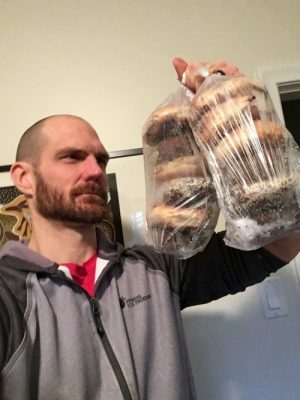 So I ask her if she bought any food he could eat and she responds, ‘Oh yeah so she grabs the bag from him and brings it to the kitchen and it’s a giant bag of…you guessed it bagels, actually 30 bagels to be exact. They were on sale and we have leftover cream cheese from the cake we Tiffany made for our son’s first birthday. Why did you buy so many bagels? You just told me that you are the lightest you’ve been in 10 years and now you’ve bought bagels, which are fancy crackers in the shape of a circle, if we’re being completely honest, and your plan is to use the leftover cream cheese from the cake you made for our son’s birthday, which by the way there is approximately 100g left which is enough for approximately five or six bagels if we’re using a good cheese to bagel ratio. Her response was ‘What? They were on sale 15 for five dollars, I couldn’t make up my mind so I bought 30. To which I had no response, except for a facial expression somewhere between stern, pensive, angry and confused, because just days ago she informed me she was pretty sure she was the skinniest she had ever been in her adult life, because she had stopped eating cheese and a processed or refined carbohydrate. Now I know what happened here, she knew we had some leftover cream cheese from a party we recently had and then she saw bagels that were on sale, she couldn’t make up her mind about which ones to get and she thought, oh these are such a good deal I will just buy them all and that will give me something to eat this leftover cream cheese with, so she infiltrated our house with 30 bagels. Have you ever self-sabotaged your weight loss in this sort of way, where you’re really happy with how things are going and maybe even a little surprised at the fact that you don’t miss some of the foods that you’re no longer eating and that it’s not as hard or challenging as you originally thought it would be, but then you’re shopping and you go down that aisle you shouldn’t be going down, I think we all know which one I’m talking about or you find yourself out with friends and everyone is ordering something that looks really good and you think, oh what the hell you only live once or I’ve been pretty good until now, or maybe you see something on sale, and you think you know, that would go really good with my leftovers and then before you know it, you quietly fall back into the old habits you had vowed to change, even though you had been making so much progress breaking them. Let’s go back to my wife’s example and take a look at what some of the contributing factors could have been. I mean, I can never know for sure what they are, but here’s my objective and moderately detached look at how it happened and the beliefs she has about why it happened. We had leftover cream cheese (after not buying cream cheese for months) to make a birthday cake, okay, we decided we weren’t going to eat something anymore, but apparently needed it for the special occasion that was our son’s birthday cake. This is belief 1 that needs to be challenged – our son needed a cake for his birthday – no one needs a cake for their birthday there are lots of way that you can make events special without cake (I thought we had agreed to make homemade banana ice cream which is just pureed banana and cocoa mixed together and frozen, that’s it and Cooper loves it. Here’s belief 2 – We have leftover cream cheese that needs to be eaten – now I hate wasting food it’s one of my biggest pet peeves, however we could have given it to a family member that is going to buy cream cheese anyway, we could have frozen it to save for something else to bake or we could have put it on smoked salmon or something slightly healthier than bagels. Here’s belief 3 – That when something is on sale, even if it’s something we’ve collectively decided not to eat, she should still buy it, because a sale is a sale and sometimes you just have to buy stuff that is on sale, even if it’s a food we we’re supposed to stop eating. I’m not saying I’m perfect, far from it and I have my own limiting beliefs some of which I’m very aware of, like I have to drink a very specific type of beer when we have games nights with certain friends or that I have to eat something sweet after eating spicy nachos. Other beliefs run in my subconscious mind that I have no idea about, that I’m sure other people could pick apart in a second. What I am saying is, that if you’re someone that has ever struggled with self sabotage or fallen off the bandwagon in any kind of substantial way that it might be helpful to step back and take a look at your beliefs and how they contribute to how you’re living and why you keep falling back into old patterns or making similar mistakes over and over again. Also I think it would help to note that none of these beliefs really had much to do with the type of food, they were behaviours around food. Taking a hard look at your beliefs, won’t be easy, but the more you can understand yourself and the more aware you can be about your beliefs and your patterns the easier it will be for you to manage them and eventually you’ll be able to avoid them because you’ll recognise them as they come up. Wouldn’t it be rewarding to be able to take control of your life and your beliefs instead of letting them control you.